The INFP life isn’t typically a traditional one. INFPs make up only 4.4% of the US population, so it’s pretty unusual to come across them very often. But they tend to enjoy this, because they like being different. It can be lonely sometimes, and it can be difficult, especially in the younger years. But INFPs don’t strive to fit in to the crowd, they aren’t pre-occupied with blending. 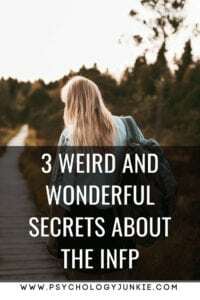 Being weird is good for an INFP; it’s one of the things that helps them to be creative, think outside the box, and see unusual and incredible possibilities. So what are the unusual, possibly “weird” characteristics that make INFPs stand out? Let’s find out! INFPs love to “connect the dots” and see relationships and connections between things. They are always trying to figure out, “where will this lead?”, “is there a possibility here?”. Instead of seeing things individually or separately, they see everything in clusters. Everything is collective and related to everything else. This gives them the ability to make intuitive “leaps” and discover clues and truths that other people easily miss. INFPs use a mental process called Introverted Feeling, or “Fi” for short. This process gives INFPs an awareness of the emotional safety and authenticity levels of others. INFPs listen intently, and according to neuroscience expert Dario Nardi, they are the “consummate listeners”. INFPs (and ISFPs) are known for actively listening longer than any of the other personality types. While other types tend to formulate their own responses while the speaker is still talking, INFPs prefer not to do this, instead listening as long as possible to understand completely. This ability to listen so well gives INFPs an insight into the sincerity, motives, and agendas of the person they are listening to. Because INFPs are so idealistic, and because integrity is so important to them, they hold themselves to extremely high standards. They can’t go against one of their core values without feeling bitterly sorry for it. So while they often have a “live and let live” approach to other people, they ask quite a lot of themselves. Poet John Milton described this mindset well when he wrote, “He who reigns within himself and rules passions, desires, and fears is more than a king.” Milton is considered by many typologists to have been an INFP and you can see the inner desire for purity, truth, and integrity in all of his work. In What Ways Are You Weird and Wonderful? Do you have any thoughts to add? Be sure to share with us (and other readers) in the comments! My communication methods take some getting used to, according to others.